Credit: NASA. Download this image (JPG, 489 KB). [20-Aug-18] The Multiple Opening/Closing Net and Environmental Sensing System (MOCNESS) is deployed off the bow of the R/V Roger Revelle during the EXPORTS cruise. 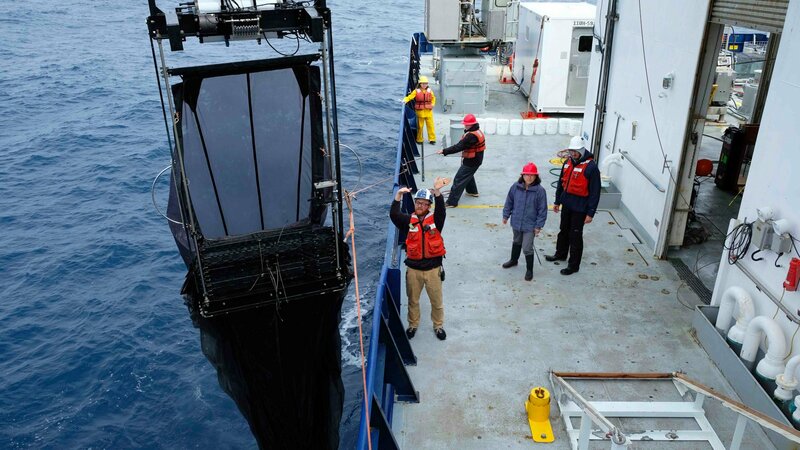 This specialized net, which includes many different smaller nets that can be used at different depths while being towed behind a vessel, enables researchers to catch plankton throughout the water column. This particular net collects zooplankton and other creatures at nine different depths in the Twilight Zone.